'Productivity' is always a key word in business but approaches for improving performance to increase productivity are diverse. Multitasking is an approach that is often misunderstood. It has become something of a feature of the modern workplace, so it's worth taking a look at what's going on in the brain when we multitask and considering whether it really does benefit us in the ways we imagine. We may consider that we are good multi-taskers because we can shave and make dinner plans at the same time; or stir the pasta sauce while following the news on TV; but in these situations one of those tasks is a deeply embedded, automated task that doesn't really have to consciously engage the brain - and the other one is the focus of our attention. Unfortunately this scenario often has grave consequences, when extended to driving a car and talking to a friend on the phone; driving is taken as the 'automated task' when in actual fact it is not and the road requires our attention at all times. 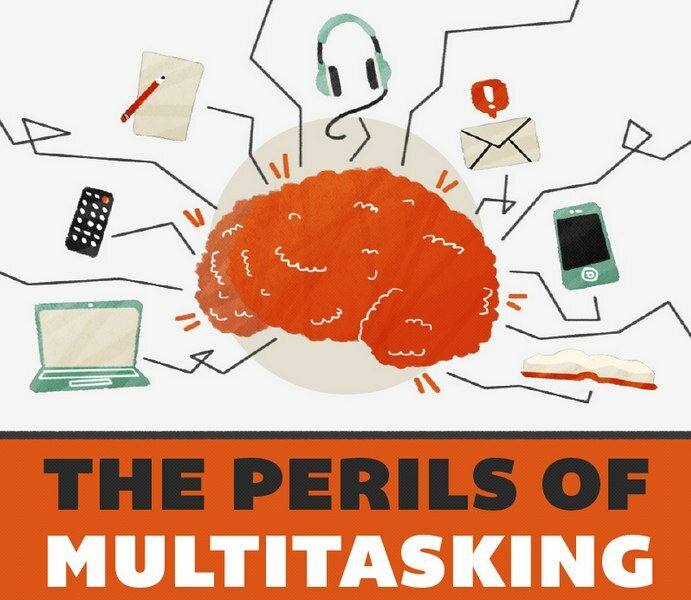 All the evidence suggests that multitasking is simply not possible without performance suffering - UNLESS two conditions are met, according to an article published in Psychology Today in 2011: one of the tasks must be so ingrained that no focus is necessary; and the tasks must involve different types of brain processing. The article uses the example of reading while listening to music without lyrics - this is possible because the music and the text are using different types of brain processing; however, where the music has lyrics, it's another matter and our powers of retention of what we're reading will be diminished because we are using the same language center of the brain. The more we know from neuroscience the more it appears that our brains are not made to receive and process multiple streams of information at the same time but perform better when there is a particular direction to focus on. 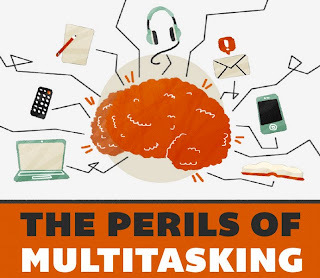 There is even evidence that the people who multitask the most are the least capable of any important aspect of multitasking. The implications of these findings stretch beyond the inability to recall what a customer said because you were sneakily reading a text message under the table at the time. Unless you are wholly focused on the task in hand, the likelihood is your performance will suffer. Much of your most productive time at work depends on deep thinking and that is made less possible in a work environment where there is constant distraction from mobile gadgets and all the other 'noise' around you. This may consist of your colleagues, an over-zealous boss who thinks you're superman and keeps piling new and urgent tasks on your desk; or you may be your own worst enemy and keep telling yourself that you can do two things at once, when you probably cannot. The truth is that most of the time, having one thing to do is enough; the rest can and should wait until the most important task has been successfully completed. This is why it's important to be adept at setting priorities and at time management; and also why there should be guidelines for use of social media and the many communication channels available in the workplace. It's important for leadership to drive the message from the top and create an organisational culture where people are not placed under unreasonable pressure that can drive them to multitask to get things completed on schedule. Otherwise we may be doing more harm than good, both in terms of productivity and employee satisfaction and motivation levels. The information age, which promised to make us more connected and more productive, is in danger of having the reverse effect unless we are aware of the dangers of multitasking. Let's get back on this bandwagon. I suggest you read Part 1 if you have not yet. What about those who have had financial setbacks following "The Great Recession"? Loss of job, short sales, foreclosures, bankruptcies, medical bills, slow payments, collections, etc. This stuff is real! IT IS REAL LIFE! Yet, the consumer protection laws dictate how the information is reported and the burden of proof is really on the creditor. Even though the credit reporting agencies get the information from the creditors, consumers have the right to demand proof that the debt is truly theirs and is reported properly or the credit reporting agency must remove the information from the credit report. So here is the simple strategy to easy allow Real Estate Agents to Sell 2 to 3 more homes per month. They should work with consumers who have less than perfect credit. You read that right. WORK WITH CLIENTS WITH POOR CREDIT. There is an abundance of these clients. If you set yourself apart and proactively work with them in 2 to 3 months you will see a dramatic increase in the number of homes you sell. Now I am not advocating you actually drive them around and show them houses. No, Not At All! They must be credit qualified before you show houses. But, if you develop a proactive program and establish a working relationship with a good reputable credit restoration company that you can refer these clients to, your business will definitely increase. OK, you do the math. How many people do you talk to every week that do not qualify because of credit? Is it 10, 20, 30 or more? What if you could work with 10% to 20% of them conservatively. That means 1 to 5 new potential clients added to your pipeline every week. If every month you added 5 to 20 new clients that you otherwise would not have worked with as qualified buyers do you think you can sell 2 or 3 more homes each month. In conclusion if you develop a relationship with a reputable qualified credit restoration company that you can confidently refer your clients to for successful credit restoration and counseling, you would easily increase the number of homes you sell by 2 to 3 per month. 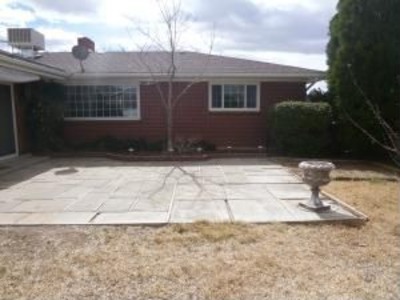 Gorgeous ALL BRICK Mossman with GLEAMING Hardwood floors, thermal paned windows, Beautiful big lot and backyard with VIEWS of the Sandias. Great floorplan - very light and bright. Wonderful Stardust Skies neighborhood. Walk to excellent schools: Comanche, Cleveland and Sandia High! 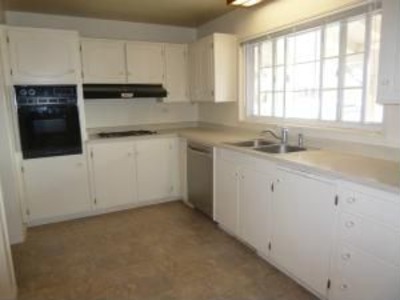 Close to UPTOWN and neighborhood shopping, parks, tennis courts, etc. This simple strategy can help you sell at least 2 to 3 more homes every month. This is no mystery. This is no magic formula it is just simply increasing the number of qualified buyers in your sales pipeline. 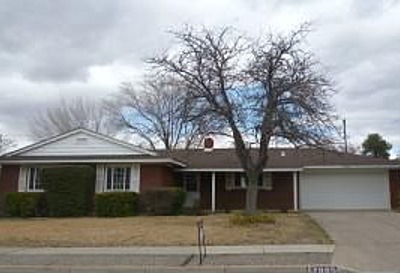 I am sure you have had an open house, advertised a property for sale, put a yard sign out on a property you have listed and otherwise just marketed a home to receive lots of calls. I am sure when you receive those calls you ultimately want to build a relationship with the buyers and if they are not represented, you would like to represent them in their home search. As you pre-qualify them you want know if they are ready to buy now or when they will be ready to purchase a new home. I am not a Realtor Estate Agent or Broker but I am sure all agents and brokers know that most of these shoppers are not mortgage ready. Many real estate professionals choose not to work with them until they are mortgage ready. This may be a very big missed opportunity. In today's financial climate the majority of non home owners do not have the credit score to qualify to purchase a new home. Many are close and just need to learn a few minor ideas to improve their credit profile. Many more need major work to become credit qualified. There is a common misconception that if you just pay your bills on time you will have a good credit score. The reality is that how you pay your bills only account for about 35% of your credit score. When you turn that around 65% of your credit score has nothing to do with how you pay your bills. But lets assume the potential customer pays on time and all other factors line up so a customer should have an acceptable credit score. Recent Studies have shown that 4 out of 5 Americans have erroneous information on their credit reports. This means that the majority of your potential clients could have information on their reports to stop them from purchasing the home they otherwise can afford and would qualify for.